B2B marketing campaigns are outdated. It’s time for a continuous approach, I wrote in my previous blog post. Not a series of disjointed speed dates, but a long-term strategy that builds relationships over time. It is what customers want. It is what your sales colleagues want. And in the end, it is the only way to demonstrate to senior executives that marketing actually yields business results. Because senior executives care about revenue – not about views, clicks or leads. Developing a continuous, long-term marketing program is not easy. It’s difficult not to get carried away on the waves of short-term thinking. A long-term approach calls for a different mindset. And that’s a cultural change you don’t realize overnight. How to make the shift from a campaign-driven to a continuous approach? My statement that B2B marketing campaigns are outdated stirred quite a few debates on social media. Some agreed with me, others disagreed. Let me clarify the problem with campaigns, before we explore the solution in more detail. A lot of B2B companies are used to planning a series of activities within a certain period of time, to generate leads for a particular product. That’s what I call a ‘campaign’. From my own experience, the length of such a campaign is usually much shorter than the length of the buyer journey. And that is precisely the problem. The prevailing mindset is to aim for quick successess – while long and complex B2B journeys call for a long-term approach. While the campaign is running, new contacts enter your marketing database. For example, they fill out a form to download a white paper from your website. Some of your current customers may also download the white paper. So far, so good. But that’s when the problems start. As soon as you hand over your newly generated leads to your sales colleagues, the initial enthusiasm in the marketing department wears off quickly. If a marketing lead doesn’t offer a chance of short-term succes, your sales colleagues won’t give it their full attention. In fact, 70 percent of marketing leads are never followed up by sales (American Marketing Association, 2013). If, in the meantime, the marketing department has switched their attention to developing a new campaign, with a different target group and/or a different theme, the leads from your marketing campaign end up in no man’s land. New short-term campaigns are launched. 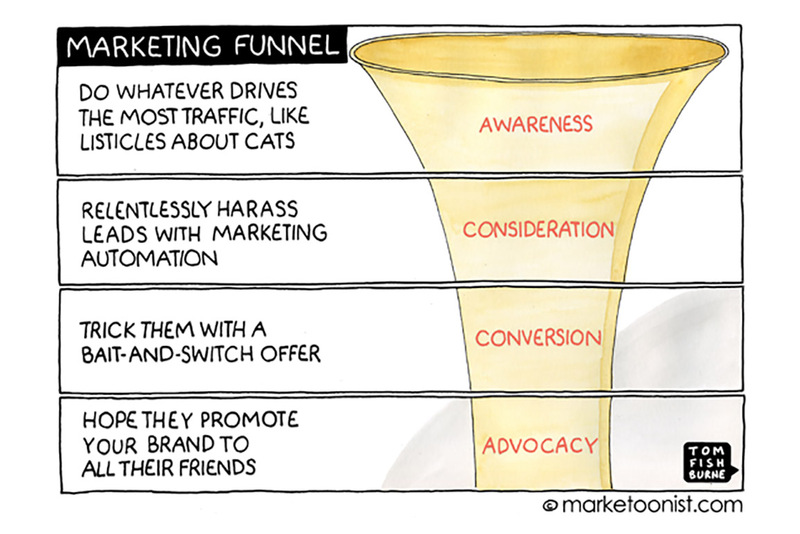 New contacts keep entering the marketing funnel. But they don’t convert to sales and revenue. Because when the buyer journey’s takes six, nine or more months, there are no short-cuts to success. That’s when the blame game between marketing and sales begins. 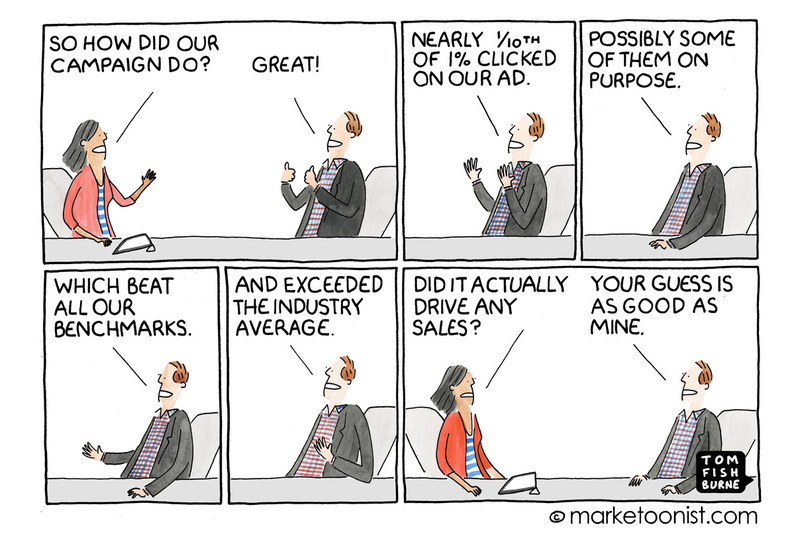 “Sales squanders our leads”, marketing complains. “Marketing leads are not really leads”, sales repudiates. When in fact, marketing and sales are part of the same problem: they don’t align their approach to the long and complex buyer journey, but both live in their own short-term oriented worlds. The blame game needs to stop. Customers deserve better, too. That’s why it is crucial to develop a long-term approach. Take your customer’s calendar as a starting point and not your company’s calendar. Don’t rush from one campaign to the next, but develop continuous marketing and sales programs that are aligned to the buyer journey. Get to know your potential customers. Educate and help them in each and every phase of their journey. Take your time to build relationships. Sow first, and harvest later. If you want to develop a continuous marketing and sales program, it is important to be aware of potential barriers to organizational change. Why is short-term campaign thinking still so prevalent? If you have a very busy schedule, like most of us do, it’s easy to get caught up in the execution of day-to-day tasks, instead of thoroughly researching customer needs. A lot of B2B marketing departments are focused on tactics and operations, at the expense of long-term strategy. In large corporations, it’s not uncommon that marketers seldom or never talk to customers. That explains why they lack true insight into their customers. Their customer’s buyer journey is often more complex, and less linear, than they are aware of. Campaigns have a starting date and an end date. That gives a sense of control. You plan a series of activities and execute them. It’s much harder to organize processes for ongoing customer interactions and optimalisation. 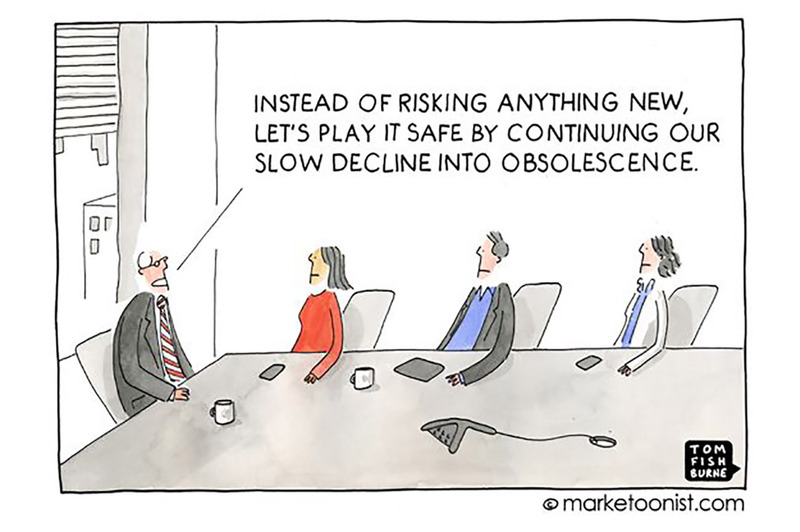 Because then marketing is no longer about ticking off the boxes. Then it’s about managing outcomes. That’s when marketing becomes responsible for business results as well. A scary thought to some. A third barrier is that traditionally, marketing departments are organized along channels and products. Catherine organises events, John sends out e-mails, Wendy is crazy about webinars and Rick is only interested in spreading the news about his product. Together, they lack true insight into their customers. The result is a jumble of campaigns; a marketing cacophony, lacking in long-term, customer-oriented strategy. These are difficult barriers if you want to develop continuous marketing programs. But you can overcome them. What follows below is a blueprint for change; inspired by Ardath Albee and Carlos Hildalgo, enriched with my personal experiences. This blueprint shows how you can make the shift from campaign-driven to continuous B2B marketing along six dimensions: objectives, processes, people, content, technology, and measuring and reporting. First of all, a continuous marketing approach calls for a different kind of KPIs and targets. Typical targets in a campaign-driven approach are: we want to generate 20.000 views, 400 clicks, and 50 leads with our campaign. At the end of month, when we have executed our campaign activities as planned, we collect a number of vanity metrics and assemble them into a nice-looking dashboard. On we go, to our next campaign. Did the newly generated leads result in any sales or revenue? No problem, sales is on to that. But eventually, as a result of bad quality leads, the ROI question comes back to hit marketing like a boomerang. A continuous approach places more emphasis on shared long-term goals. For example: “This year, together with our sales colleagues, we aim to win twenty new customers, with an average order value of 35.000 euros. On top of that, we want to build a database of one hundred potential customers that have a high chance of converting to sales next year.” Of course, short-term KPIs and targets follow from such objectives as well, but the focus is on obtaining results over a longer period of time. Results that really matter: sales and revenue. This calls for a different way of managing and appraising performance as well. A marketer who is judged on the number of views, clicks, and leads, will focus on quantity – while it is the quality of the relationship with (potential) customers that matters the most. As long as marketing leaders don’t start managing different KPIs, marketers won’t shift their focus. Forget it. In his book Driving Demand (2015), Carlos Hidalgo argues that the number of Marketing Qualified Leads is not the best measure of success. The number of Sales Accepted Leads is a better measure of success, because it compels marketers to shift their focus from quantity to quality – and because it is a meaningful KPI to their sales colleagues. Herein lies the crux of the problem: according to research by Hildalgo and his colleagues, 71 percent of B2B companies lack shared KPIs that are supported by both marketing and sales. It’s time to change that. Defining long-term, shared objectives is a good first step for marketing and sales teams. But developing a continuous approach calls for closer collaboration day in, day out. Between marketing and sales, and between marketers themselves. Running short-term campaigns is very much a repetitive, serial process. All the campaign steps are planned in advance. At particular points in the process, a content creator, data analyst or other specialist is asked to provide input. When the campaign has ended, marketing passes the baton to sales and the process starts all over again. A continuous marketing program is organized much more flexibly and responsively. Different specialists consistently work together to ensure ongoing optimization. Marketers are no longer organized along channels or products, but along customer segments or phases in the buyer journey. This new organizational structure calls for a new way of budgeting too. If you optimize your approach continuously, why would you pre-allocate your budget to different channels? Rather, you should set budgets for different customer segments or phases in the buyer journey, allowing marketers to decide how they spend their budget as they go along. That’s what Joris Merks, award-winning author of Online Brand Identity (2015), argues. This approach to budgeting allows marketers to put their marketing dollars where they turn out to be most effective. Sales colleagues should be actively involved in strategy development and content creation. But marketers should gain first-hand knowledge of their target group as well. Join your sales colleagues on a customer visit at least once a month. Ask questions. Explore your customers’ needs. You will see how far removed their reality is from your campaign reality. A continuous approach calls for different skills as well. Learning agility is one of those skills. How well are you able to learn from experience and adapt your way of working? It is something recruiters should pay attention to when selecting new marketers. Empathy becomes more important, too. You may collect all the data in the world, but it takes more than data to understand your customers. At its core, B2B marketing is still about trust and relationships – which you cannot capture in data alone. It requires human judgment to assess what kind of actions will build trust, and what kind of actions will annoy or alienate people. One small, well-timed human touch can be much more effective than ten automated campaign flows. Campaign-driven B2B companies develop content with campaigns in mind. After the campaign has ended, the content tends to be forgotten. It’s no wonder that 60 to 70 percent of B2B marketing content goes unused, sitting on sales portals and web site shelves (Sirius Decisions, 2013). In a continuous marketing program, relevant content is readily available for each phase of the buyer journey. Search engine optimization gets top priority. Your content should also be easy to find for sales colleagues who look for content to support them in the conversations they have with (potential) customers. Do you want to transform your marketing approach? Technology to the rescue! At least, that’s what marketing automation providers like you to believe. But the truth is, a continuous approach doesn’t call for more technology. It calls for a smarter use of existing technology. Too often, B2B companies use marketing automation to automate what they have always done: spam people with irrelevant messages. The real opportunity in marketing automation is not to pump up the email volume, but to use it as a tool to tailor your approach to the needs of an individual customer or prospect. The challenge is to recognize digital body language across channels, as Aldo Wink calls it. Again, it starts with understanding. Last but not least, a continuous approach calls for a different way of measuring and reporting marketing performance. 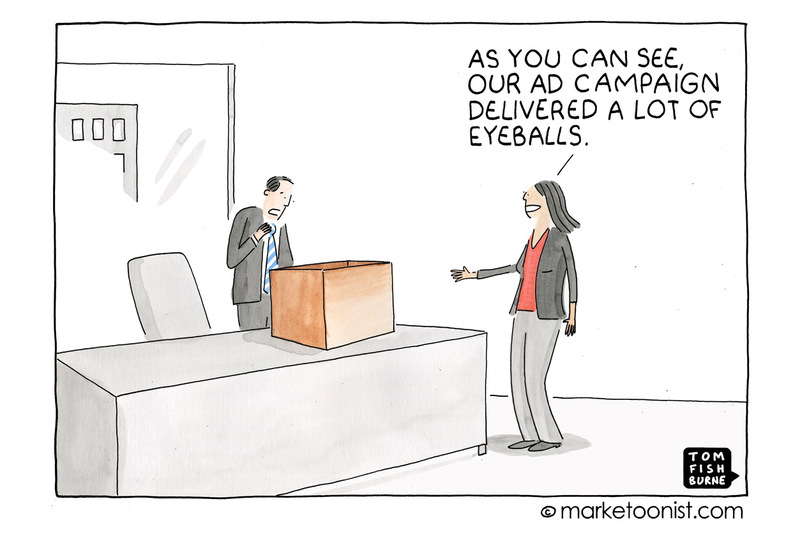 With a campaign-driven approach, results are measured afterwards, with an eye to the next campaign. Campaigns are evaluated as stand-alone initiatives with fixed start dates and end dates. What happened to those newly generated leads after the first campaign was over? Nobody really knows. In a continuous marketing program, performance is measured and optimized on an ongoing basis. Leads and customers are followed during their entire journey. Reports focus on their progression through different phases. How many contacts turned into leads? How many leads turned into customers? Analyzing behavioral patterns over time is important as well. For example, if a lot of customers downloaded a particular white paper two months before they became customers, that’s a valuable insight. Contrast that with the meaningless statistic that a total of 348 people downloaded the white paper, as you would typically read in a campaign report. See the difference? Getting all these changes off the ground requires leadership. You need someone who questions the status quo. Someone who inspires your marketing team to think in terms of relationships instead of campaigns. You could be that leader. Start small. Pick a market segment or a small group of customers, and develop a pilot program. A good starting point could be the leads generated from your latest campaign. Don’t rush to the next campaign. Try to learn more about the leads you already have. Who are these people? Can you find out more about them? And can you help them one step further on their journey? Asking yourself those questions will help you develop an ongoing program. Learn from your experiences and share results along the way. Don’t forget to look for the bright spots in your marketing team: initiatives that already have characteristics of a continuous approach. Reinforce such initiatives and use them as a springboard for further change. I’ve been through that transformation a couple of times now. My greatest weakness was that I was always in a rush to change things. But you cannot rush organizational change, just like you cannot build customer relationships overnight. Take your time. The results will reward you. Ardath Albee (2015). Digital relevance: developing marketing content and strategies that drive results. Carlos Hidalgo (2015). Driving demand: transforming B2B marketing to meet the needs of the modern buyer.